[:es]Ya en 2008, la Harley XR 1200 tenía todo a su favor. Lanzado en Europa, pero con un aire estadounidense, fue un guiño a la XR750 muy querido. Muchas revistas americanas hablaron sobre la XR, citando el motor de 91 cv y la suspensión de calidad. Ellos clamaron por la moto para que se llevase a Estados Unidos y al año siguiente se les concedió sus deseos. Pero las ventas fueron misteriosamente pobres, y la XR 1200 fue cayendo. ¿Por qué? Probablemente porque el peso era demasiado elevado (250kg aprox). En esta moto han puesto sus manos los maestros en el Café Racer Dreams. El tanque fluye en el asiento, y la postura es larga y baja. Casi todos los elementos brillantes han desaparecido, y la XR 1200 se ve mucho mejor. Lo más destacado es el amplio e impecable tanque de aluminio, una colaboración con Pablo y Carlos Delgado de la fundición Valtorón. El logotipo del estilo de 1970 es un toque retro fresco. La cola de la XR fue desechada, sustituida por un subchasis compacto y un asiento de cuero. La suspensión de la parte trasera es un par de amortiguadores Öhlins, que elevan la moto. La postura es un poco más alta en la parte trasera y ligeramente inferior en la parte delantera. Nunca nadie se quejó de la potencia del motor XR 1200, por lo que los componentes internos del motor se han dejado intactos. El sistema de escape impresionante es un Remus PowerCone con el silenciador pintado para que coincida con la pintura del motor. Un faro compacto de una Ducati Monster se ha puesto en las horquillas. 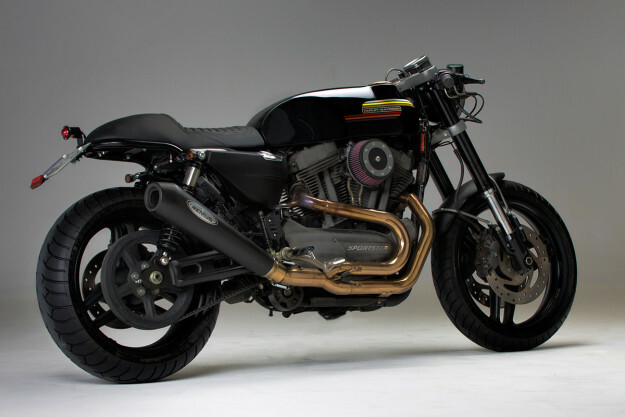 [:en]Back in 2008, the Harley XR 1200 had everything going for it. Launched in Europe but styled with an American flat track vibe, it was a nod to the much-loved XR750. American magazines went gaga over the XR, citing the 91-horsepower engine and quality suspension. They clamored for the bike to be released in the States, and the following year their wishes were granted. But sales were mysteriously slow, and the XR 1200 was quietly dropped for the 2013 model year. Why? Probably because the man-in-the-street found the weight too high at 550 pounds—and the looks were more than a little goofy. 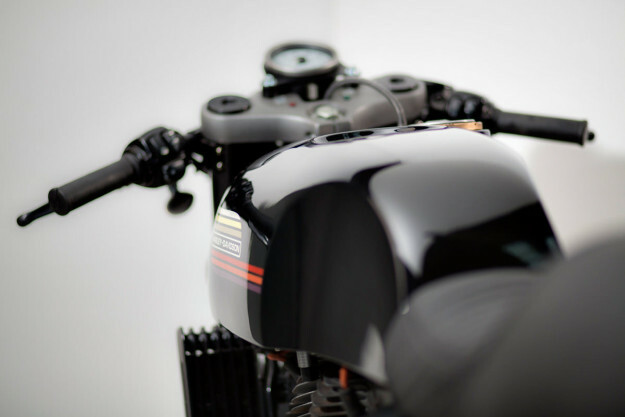 Those looks have now been fixed by the master surgeons at Café Racer Dreams. The tank flows into the seat, and the stance is long and low—rather than high-and-mighty. Nearly all the shiny bits are gone, and the XR 1200 looks much the better for it. The highlight is the broad, impeccably sculptured aluminum tank—a collaboration with Pablo and Carlos Delgado of the Valtorón foundry. The 1970s-style logo is a cool retro touch, reminiscent of the AMF-era tank designs. The heavyset tail unit of the stock XR 1200 was binned, replaced by a compact subframe and a Manx-style one-piece leather seat. Suspending the rear end is a pair of Öhlins shocks, which reportedly lift the handling to new heights. The stance is subtly altered too: slightly higher at the rear and slightly lower at the front. The forks conceal revised springs to tighten up the handling. 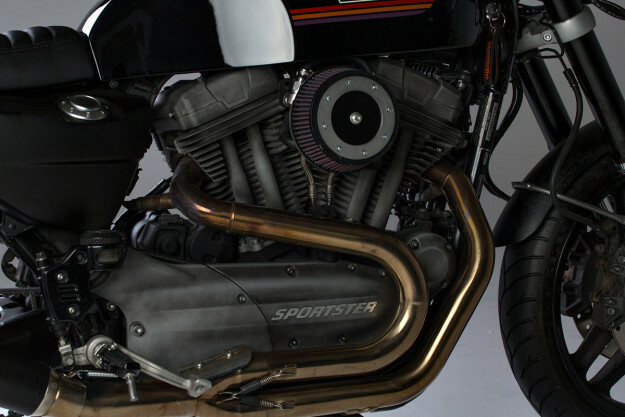 No one ever complained about the power delivery of the XR 1200 motor, so the engine internals have been left alone. 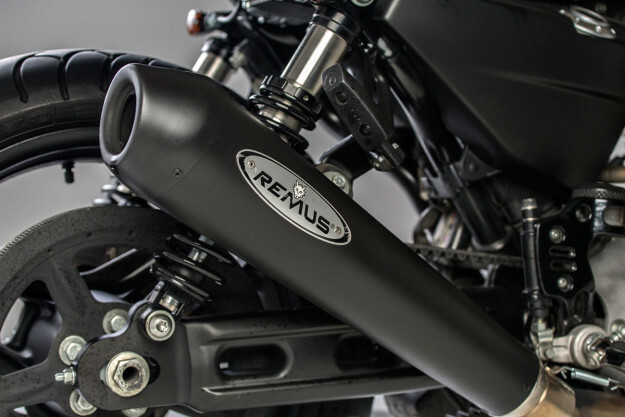 There’s a K&N intake, and the stunning exhaust system is a Remus PowerCone—with a blacked-out muffler to match the heavy patina of the engine paint. 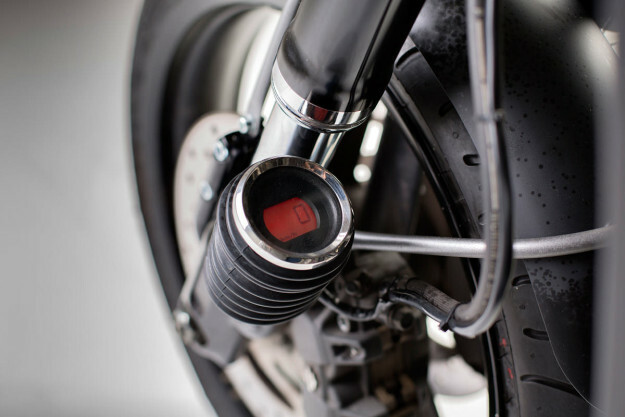 A compact Ducati Monster headlight is set into the forks, maintaining the immaculate lines. A modified fascia houses the original tachometer, which is now centered in front of the rider; the speedo has been relocated to the left-hand fork leg. We reckon this is the bike the XR 1200 should have been from the start: A long-wheelbase stealth bomber, pitched against the Japanese heavyweights and the likes of Moto Guzzi’s Griso.